We pretty much start off where we left off and that is Olvier telling Diggle, Felicity and Curtis that he is stopping his crusade and disbanding Team Arrow. Diggle and Felicity think Oliver should think about it and not let Adrian get to him. But Oliver insists and that Adrian was right about him. Diggle and Felicity aren’t to be dissuaded and bring Team Arrow 2.0 to Felicity’s apartment to be the new Arrow Cave. Meanwhile, Felicity takes off to Helix and with their help, they found video footage of Adrian pulling off his Prometheus mask revealing his true identity. Unfortunately, Adrian’s face is pixellated and learn that he has a scrambler on him. Felicity and Helix work on finding way to unscramble his face. Back at the Mayor’s office, Oliver breaks up with Susan and then enlists the Bratva to kill Adrian. Team Arrow 2.0 are alerted to a robbery at a medical lab. When they arrive, Diggle sees Anatoly and his men steal diabetes medication (which is part 1 of their payment). Diggle then confronts Oliver for bringing in the Bratva. Oliver defends his decision and is still resolved at keeping the team disbanded. 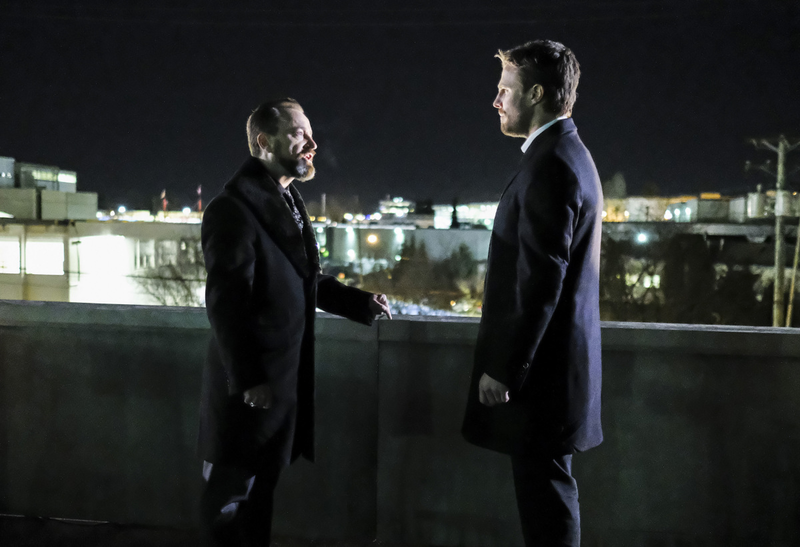 In the Russian flashbacks, Oliver has decided to go back to Lian Yu as that is a more plausible place he could be over the past 5 years. In his lat 48 hours in Russia, Anatoly plans a heist with Oliver to steal valuable tuberculosis medication. Back to the present day, Team Arrow 2.0 are alerted that Adrian is on the move and that mean the Bratva will be there too. Team Arrow 2.0 decide to stop the Bratva from killing Adrian so he can be taking in and b brought to justice. Team Arrow 2.0 does stop the Bratva and Adrian, who gets hit in the shoulder, runs away but Curtis chases him and the engage in a fight. Adrian of course wins but Curtis uses his T-sphere to get something off of Adrian. Curtis tracks Felicity to Helix and reveals he stole Adrian’s scrambler. Unfortunately it is heavily encrypted and Kord Industries as the tech to decrypt it faster. Because of Adrian’s attack, he is now being forced into Witness Protection. Oliver is forced to go along with it. Oliver then goes to Diggle to admonish him for getting in the way of the Bratva. Diggle wants Oliver to open up to him and that he devoted 5 years of his life to his crusade. Oliver then tells Diggle that he followed him based on a lie. Oliver admits to Diggle that Adrian got him to admit that his crusade was about satisfying his thirst to kill. Diggle gives a speech that convinces Oliver to stop the Bratva from killing chase. Oliver then brings back Team Arrow 2.0 and head off to Zarn Corporation where the Bratva are collecting part 2 of their payment that will help turn the diabetes medication into a street drug. Team Arrow 2.0 (Oliver is there but not in his Green Arrow costume), and stop the Bratva from stealing the drugs and killing hostages. This now puts Anatoly and Oliver at odds breaking their years-long friendship. Felicity and Curtis are MIA on this mission because they are at Kord Industries to unscramble Adrian’s image, which they end up doing. The two present Oliver and company the image of Adrian as Prometheus. This is great news for Team Arrow 2.0. Dinah brings the video into SCPD and Quentin gets the cops to call in the US Marshals to bring in Adrian. We see Adrian under police protection when the text comes in. Adrian knows something is up and kills his police detail. Adrian drives away as the police head towards him in the opposite direction. I have to say that Josh Segarra is pretty chilling as Adrian/Prometheus that I am interested to see what will be his downfall.